Early Soulard History. The area known as Soulard was once part of the estate of Antoine and Julia Soulard. Antonie came to St. Louis via New Orleans, having left France to literally save his head — he was a loyalist to King Louis XVI. Once in St. Louis he did well for himself by marrying into the wealthy Cerre Family, and as a surveyor he was granted a great deal of property in payment for his services. But a problem developed when they decided to sell part of the estate. They had been granted the property under the old Spanish land grants and had to sue the United States government for clear title. Antoine died and Julia settled the case in 1836 by paying two thousand dollars to secure clear title to the property. With a clear property title in hand she began subdividing the property and selling off lots, thus becoming the first female real estate developer west of the Mississippi River (and maybe in America). The first parcel was sold to Bishop Rosatti and you can see the church that was built on the property across I-55 – just northwest of the Market. Julia gave two city blocks to the people of St. Louis with the stipulation that the land should forever be used as a public market. 812 Soulard Street — Trinity Lutheran Church and School. Founded by German emigrants in 1839, Trinity is the oldest established Lutheran Congregation west of the Mississippi. The original building was built in 1864 at its present location, but the tornado of 1896 destroyed a major portion of the Church. The congregation retained as much of the previous building as possible, while erecting a new edifice in the American Gothic Style. The ornate vestibule is part of the original 1864 structure, and looks much like a European Cathedral. Just adjacent to the church is Trinity school in operation since 1839. Soulard Farmer’s Market. The first market house, built in 1843, was destroyed by the tornado of 1896. Two sheds served as the market until 1928, The architect, A. Osburg, patterned the south entrance the new market after the Founding Hospital in Florence, one of the first masterpieces of the Italian Renaissance designed by Filipo Brunelleschi. 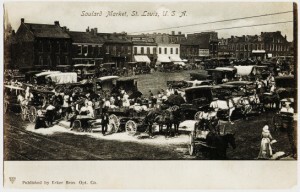 Soulard Market is the best known landmark in the Soulard Historic District. People come from all over St. Louis to take advantage of the Market’s low prices on fresh fruit and fresh produce. 1812 South 8th Street is thought to be one of the oldest houses in Soulard. This half-flounder house features wood lintels (upper part of the window or door frames) and a back entrance. The back entrance not only provided a greater privacy, but also allowed additional windows along the street for more light and increased ventilation. 1832 South 8th Street is a good example of a custom built Victorian townhouse set back from the street on a generous size lot. The home once belonged to Philip W. Schneider, also known as “Granite Schneider”, a city contractor who first brought attention to the excellent quality of Missouri granite. Schneider supplied granite for Eads Bridge, City Hall, the Old Post Office, and many of the other large buildings in Illinois, Ohio and Tennessee. His granite quarry became what is now known as Elephant State Park in SE Missouri. He died in 1905; his mausoleum of Missouri granite stands in Saints Peter and Paul Cemetery. 1833 South 8th Street is St. Elizabeth’s Settlement and Day Care Center. This structure which retains its original ironwork was built as a private mansion and then given as a settlement house for German immigrants. The home has been restored to a beautiful single family residence. The first electric light in Soulard was turned on in this home. Allen And 8th Street Saints Peter and Paul Church and School. 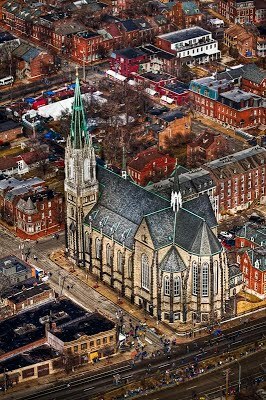 Saints Peter and Paul Church and School, the largest and most elaborate Catholic Church in Soulard, is a classic example of Gothic Revival architecture. The parish began in 1849 with only two small frame buildings at Seventh and Allen; a one story residence on Geyer served as a temporary school. In 1853 construction was started on the Sister’s School. When completed the church and school eventually covered an entire city block. The current structure, designed by a New York architect, was erected in 1875 and seats 3,000 people. 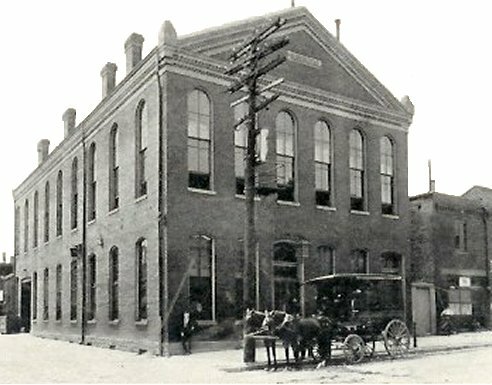 In its heyday, nearly 1,400 children attended the thriving school. The school has been converted to loft apartments. 1827 South 9th Street. Henry Soulard, son of Antoine Soulard, sold this lot in 1849. This single family dwelling built around 1850; is registered by the Historic American Building Survey. The house is a good example of Creole influence featuring a two story gallery porch running the width of the house. A special feature of this house is the 6 over 6 windows (6 over 6 refers to the number of glass panes on both the upper and lower portions of the window). This window style was very popular at the time of the Civil War and it is unique to see the original windows intact. These windows were probably preserved with the protection from the two story porch. Located in the heart of the Historic Soulard neighborhood – just a mile south of downtown Saint Louis. The continuing mission of the Soulard Business Association is to support business owners in way of promotion, communication, event planning, and community involvement. Businesses, non-profits and individuals can support the Soulard Business Association through modest yearly dues. Call (314) 323-8706 or email info@historicsoulard.com for membership information.